Click on poster for more posters in different languages. To celebrate the 40th anniversary of Louise Brown, the first baby born as a result of in vitro fertilization (IVF), Fertility Europe launches its #HappyBirthday campaign in the European Fertility Week 2018, which is held from 5-11 November 2018. How many times a year do we say, text or type the words “Happy Birthday” without much thought? For those who wish to have a child, but struggle with infertility, the phrase has a deeper meaning. 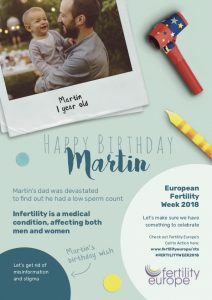 Patients organisations from across Europe will be joining in a week of action to highlight the significance of birthdays for families who have overcome infertility and share stories of encouragement with those still hoping to become parents and those who remained childless. We also have a couple of birthday wishes, please check our posters. 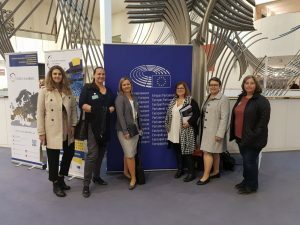 Fertility Europe team meeting MEPs to get their support for the Call to Action. At the European Fertility Week 2018, Fertility Europe is launching a Call to Action to policy-makers across the European Union, to help improve the lives of everyone who is experiencing fertility problems. Infertility affects one in six couples worldwide, 25 million citizens in the European Union only. Every year, the number of people referred to infertility centres increases by 8-9%. Yet, despite there being over eight million people worldwide born thanks to fertility treatments, patients still face stigma and battle with a lack of information and barriers to access treatment and funding. In the video below we interview random people about their knowledge of infertility. In the video below we’ve put together statements of infertility patients about their challenges. Please follow us on social media for more info!